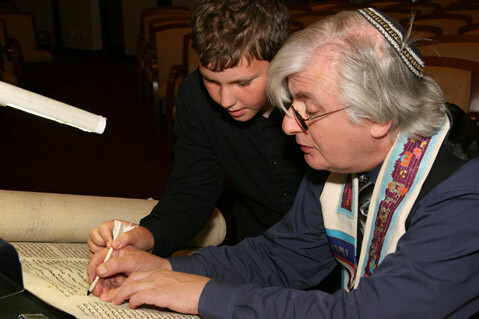 Sofer Neil Yerman works with Max Gaynes, age 10, as they restore a letter in a 200-year-old Czech Torah. Congregation B’nai B’rith began the restoration of its 200-year-old Czech Torah on October 30. After a ceremonial hand washing, groups of 20 to 25 congregants engaged in a discussion about the section of the Torah they were rewriting. Then a scribe held each person’s hand as they wrote their own letter in the holy document and completed one of the 613 mitzvahs — literally “commandments,” but commonly understood as “good deeds” — outlined in the Torah. Over 70 years ago, under the watchful eye of Nazi soldiers, Jewish curators began the process of sorting, cataloging, and maintaining stolen Torah scrolls in a dusty Prague warehouse. By the end of World War II, the Nazis had pilfered over 1,500 Czech Torahs, which were never returned to their communities. When the collection was made part of Prague’s state Jewish Museum, improper care led the scrolls to fall into decay. In 1963, London’s Westminster Synagogue purchased the scrolls from the Czech Republic and began to distribute them to Jewish synagogues, universities, and organizations across the world. By the end of the decade, Santa Barbara’s Congregation B’nai B’rith had its own Torah from Pribram, Czechoslovakia. For the past 30 years, the Pribram Torah has only been used on Yom Kippur, the holiest day of the Jewish calendar. Its delicate state has made extensive use dangerous. The restoration is lead by Sofer Neil Yerman, who is one of the only two U.S. scribes authorized to work on these historic scrolls by the Czech Memorial Scrolls Trust. A sofer generally acts a writer and calligrapher for many Jewish documents, specializing in Torahs. Yerman, whose career spans 25 years, also creates one-of-a-kind documents for life-cycle events, family trees, and bar and bat mitzvahs. His work emphasizes community involvement as a way to promote physical and spiritual appreciation for the Torah. He is currently in residence at Sinai Free Synagogue in Mt. Vernon, New York. The writing sessions will occur through April 2012, when the scroll will be complete. There is a $36 donation per letter.